Blue Mistress is now snug in her winter berth, very different from the exposed swing mooring of the past three months. She looks small among the high-sided yachts around her, like a new student in a strange school. For me the short trip from mooring to berth, from one river to another, the Tamar to the Plym, held more than an Autumn afternoon jaunt. The gps reads 3.33 nautical miles, but that’s only distance. It took about an hour, but that’s only time. In terms of maritime history, distance and time, this stretch of water is endless. It’s full of human stories – modern stories that has been going on for centuries. Stories of people setting out to explore their world using that most adventurous of ways to travel – on water. Throughout the year, many thousands of holiday-makers, lorry drivers and business people cross the track I was taking. But long before the industrial age and ages of technology and information, people have left from here to explore the world, go to war, leave their home country for a life overseas, circumnavigate, trade and so on. They have lifted their faces to the same weather, smelt the same sea and felt that first lift of swell beneath them. Many of the names have been with me since I was knee high. I don’t believe they were all paragons of virtue but they sure made an impact on the world. In 1577, Francis Drake, started his circumnavigation in Golden Hind from Plymouth. 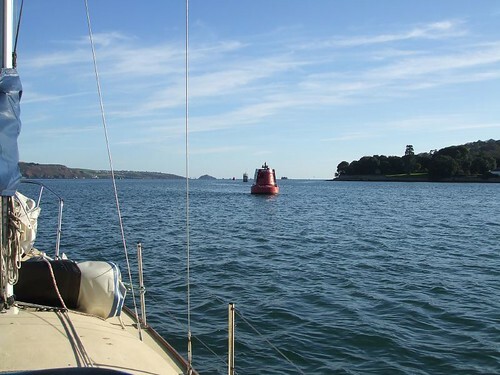 Three years later, he moored off Drake’s Island (on the right of the picture) before heading up Channel for a triumphant return. On 19th July 1588, now Sir Francis Drake, he and the English fleet slipped out of Plymouth to tail the Spanish Armada up the Channel to meet them in battle off Gravelines on 29th July. In 1768, the Endeavour, under Captain James Cook, left from Plymouth on the first of his three voyages of discovery. In 1772, on his second voyage, he was accompanied by Captain Furneax, who charted the coast of Tasmania and in 1773 was the first Englishman to land there, and Captain William Bligh of the mutiny on the Bounty fame (April 1789), who later became governor of New South Wales from 1806-1809. In 1776, Cook again left from Plymouth on his ill-fated third voyage. On 12th May 1839, the Tory sets sail for New Zealand with settlers. Between the 19th November 1840 and the 3rd September 1842, six ships left Plymouth with settlers bound for New Plymouth, New Zealand – the William Bryant, the Amelia Thompson, Oriental, Timandra, Blenheim and Essex. A plaque near the Mayflower Steps remembers the thousands of Cornish men and women who sailed from Plymouth, miners and farmers to settling in South Australia. Not only Australia. In 1973, near Russell, in the Bay of Islands, New Zealand, we came across a small cemetery with many graves of Cornish miners. 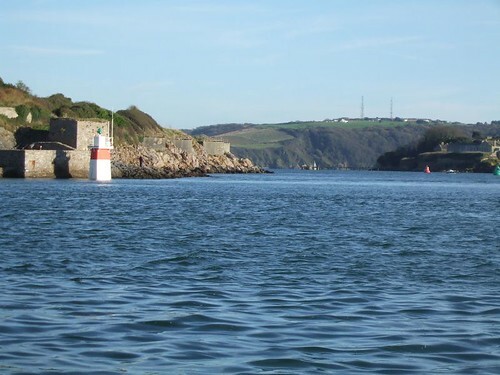 Between 1812 and 1841, Plymouth Breakwater was built to create one of the largest sheltered harbours in Europe. So , the Pilgrim Fathers, James Cook and the early transport ships would have set out into a bay into which a strong southerly swell could keep ships in port for days on end. We passed Plymouth Hoe, with the prominent landmark of Smeaton’s Tower. This was the light on the Eddystone Rocks from 1756 to 1882 and would have been welcomed by the ships of the time, but the rocks were unlit in Drake and the Pilgrim Fathers’ time, a troubling navigational hazard some 14 miles off Plymouth. 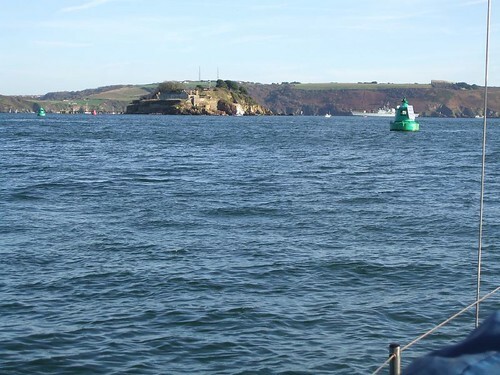 The Naval Dockyard at the beginning of our short voyage was started in 1651. Before this, it was based in Cattewater, which was where we were headed. During every war since, and the peacetimes between, including the First and Second World Wars, sailors, (and soldiers on the troop carriers), have journeyed through this water to unknown fates – many outstanding heroes among them, and many who were never to return. Only last week, in Iraq, we sadly lost a young marine who would have known this stretch intimately. In the late sixties both Francis Chichester and then Alec Rose refitted on the Cremyll bank of the Tamar at Mashfords. For some reason, Chichester’s feat shrank the world far more than air travel. For generations, the sea had been a route to adventure and the unknown. Sailors had gone to sea not knowing whether they would return. They had used the best of modern technology (bigger ships, better sails, different rigs) and that technology had evolved to meet the needs of exploration, trade and war. Now it was possible for men to race round the world solo in small boats. Setting sail for exploration, battle and trade had been joined by challenges of a more personal, leisurely kind. This was hugely innovative and, as with all innovation, the next stage is organisation, and so OSTAR – the Observer Single-Handed Trans Atlantic Race, which had started in the Royal Western Yacht Club in 1960, developed and grew. Single-handed sailing has come a long way since Hasler and Chichester’s initial race across the Atlantic. As I write, eight purpose-built yachts are competing in the Velux 5 Oceans race around the world and no less than 74 started in the Route du Rhum across the Atlantic. Phil Sharp, a Brit from Jersey has just won the Classe 40. These boats are filled with equipment that Chichester and Rose could only dream about. And we can now garner news of these yachtsman more or less instantly. Video links put us in the yachts in the Southern Ocean – we live through their crises as they happen. 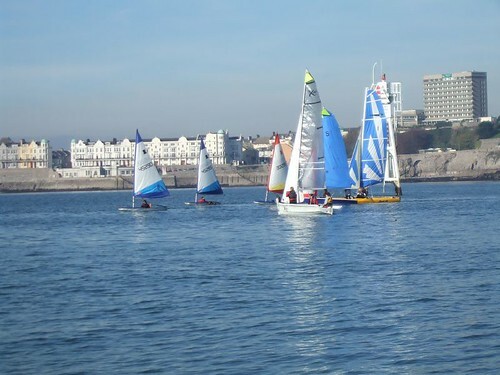 Near Mount Batten, we passed through a small fleet of youngsters dinghy racing (actually they shot round me). Perhaps the same youngsters were in the picture I took the following Sunday morning, looking for wind in the calm November sunshine. No time for romantic illusion here, they have the technology, winning is what counts and the wind is for the taking. These are the inheritors of the legacy that the generations above have left – plus some. This is the generation that will face global warming head on. Maybe its effects will not be as dramatic as some forecast, it certainly won’t be as miniscule as others hope. The reality will be somewhere in between, and the effect will be seen on the sea and in weather patterns before its effect on land. As sea levels rise, it is not just the volume of water but the weight of water that we need to be concerned about. The tides will continue to rise and fall, but there will be more water flowing and if when the weather patterns dictate low pressure the water height will rise further and the weightand speed of tidal flow, combined with intermittent storm surges, will try our sea defenses. We will need those who can read the sea and make best use of the weather. On this stretch of water, as on other stretches of water around the globe, this is where it starts, this is the training ground. These young people will be the heroes of the future, working with new technologies but dealing with the same elements with the same respect as those who went before them. Every generation leaves unfinished business for those who follow. When the philosopher wrote, ‘whatever, you want, oh, discontented man, stand up, pay the price and take it!’ he meant us not only to have the courage to take up the challenge but also to take notice of the price to be paid for doing so. Naturally, we have taken, but unfortunately (and perhaps inevitably) we have paid little heed to the price. Man has stepped out to reach as high as he can. Amazing feats have been accomplished, and wonderful innovations created. As the momentum of that taking has steadily increased, we have built a powerful head of steam. Now it is imperative we pay attention to the price and deal with it. That price is high. Technology carries a large part of the answer but not all of it. Unfortunately, the very success of technology, (some would say it’s glamour), has blinkered us, causing us to rely on it and to think of progress as a headlong technological rush forward. Nowadays, we seem to discount even the recent past. It’s as if the past has become a foreign country. We have forgotten that it was inhabited by exactly the same people as us – also facing the unknown, also having to find solutions to overwhelming problems. Yes, we have to face the challenges ahead ourselves, but we would do well to look back and learn from the experience of those previous generations. Every problem carries it’s own solution, but, in this case, technology alone is not the answer. We need to look further.